Emilie-Claire Barlow in studio 1! Het orkest is gevraagd om deze week de nieuwe cd van de Canadese jazz zangeres Emilie-Claire Barlow op te nemen. Woensdag en donderdag wordt er onder leiding van Jules Buckley hard gewerkt om in deze korte tijd een heel album op te nemen. Omdat ze helemaal uit Canada komt om hier op te nemen en omdat ze hier nog minder bekend is hebben we haar een paar vragen gesteld! Why are you recording your album in the Netherlands with the MO? My co-producer and collaborator Steve Webster had originally discovered the MO while doing some research on Weather Report material. He came across the MO’s series of Joe Zawinul’s music and was excited and inspired to find a jazz orchestra with such history. When we decided to pursue an orchestral album, he introduced them to me. We love the fact that the MO has a sound and a personality of its own. In addition, the fact the MO is a jazz orchestra makes them perfect for this album. 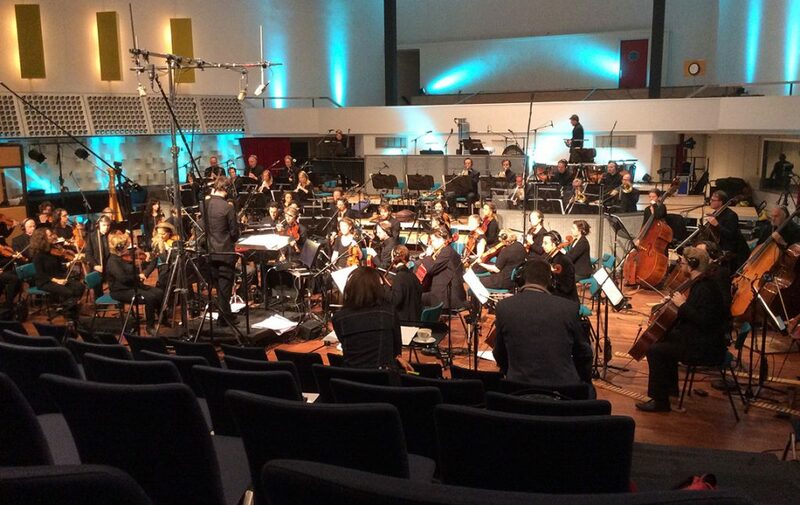 In general, we are excited by all of the musical projects that the Metropole Orkest is involved in. We can feel their passion and enthusiasm for all kinds of music and that is very appealing and inspiring. Which artists inspired you for this album? This album was inspired by a collaboration between Steve Webster and myself. It’s the first time I have ever collaborated in this way, and it has been a very rich musical experience for me. Steve is a very open musician who is tremendously creative. The writing for this album has been a process of musical discovery and exploration. This album is not inspired by any specific artist but by any artist that strives to reach for something bigger and more challenging musically, and personally. The repertoire and arrangements on this album are all very personal to me. This is an opportunity for me to push myself musically, and to dig deeper as an artist, performer, and arranger. It’s a dream come true to have the full orchestral palette to work with, and to have a conductor like Jules Buckley to bring our scores to life. This project has already been a challenging and rewarding musical experience. One of the wonderful aspects of pursuing a project of this scope is the fact that you have the opportunity to meet and work with so many amazing people – musicians and technicians that are at the absolute top of their game and are some of the best in the world. I will consider myself a student of music for the rest of my life, and experiences like this keep me excited and passionate! How would you compare the new album to your latest studio album , Seule ce Soir? This album, Clear Day, is very different from any of my previous recordings. Of course, the fact that it features an orchestra makes it different. But beyond that, I am broadening my choice of repertoire, and I am exploring more deeply my passion as an arranger and an interpreter of song. My musical passion has always been to re-imagine a song, and with that in mind, this album is the most adventurous. Any surprises for your fans on this album? I believe that some of the repertoire will surprise the listener. And that is exactly what I’m hoping for! I love the moment when a familiar melody comes as a surprise, and to be able to present a piece of music in a whole new light. It can change the way people feel about a song, or perhaps make them hear the lyrics in a whole new way.